Get the inside track on our Hot Wheel win! 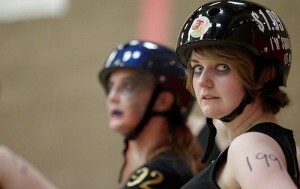 Want to hear all about our recent nail biter of a bout against Hot Wheel Roller Derby? Course you do. But this report isn’t from the bleachers. It’s not even from the suicide seats, oh no. Big Smack brings you the adrenalin pumping, hard hitting, on-track perspective through zombie contact lenses in the latest post on her fab blog – Big Smack vs The World. Go to Big Smack’s Hot Wheel bout report.